Go direct to Microsoft's page Buy at $589.99 Load on 1 PC only and forever!!! TIP If you’re ready to jump right into a project, see Basic tasks in Project 2013. To find out more about Microsoft Office, see What’s new in Office 2013. 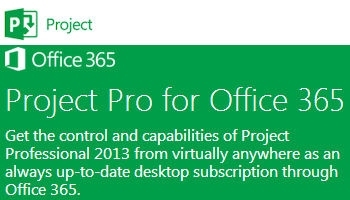 Instead of dropping you in a blank file, Project 2013 takes you to a one-stop center for starting your project. Browse the premade templates, import info from Excel or a SharePoint site, or just click Blank Project to get a clean Gantt Chart. You can open previous projects from your computer or SkyDrive from there, too. For more info about these new communication features, see IM chat with a team member. The cloud is like file storage in the sky. You can get to it anytime you’re online. Now it’s easy to save your Office files to your own SkyDrive or to your organization’s site. From there you can access and share your Project schedules, Excel spreadsheets, and other Office files.